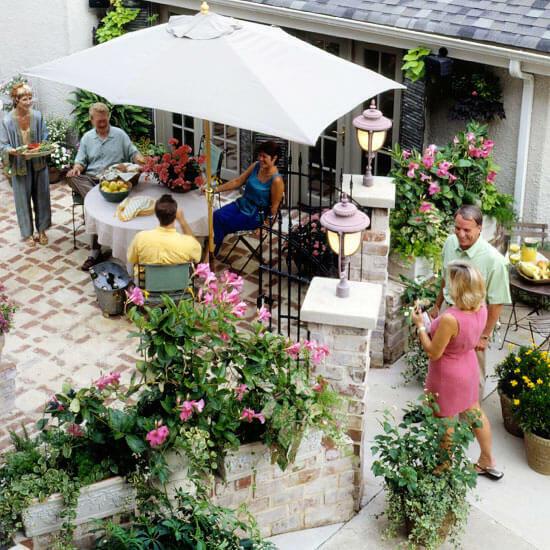 Inside your garden you can create spaces for parties, unique corners, with special details that will allow you to share your outdoor space with family and friends. To create spaces for parties will not require a large investment, you can only add some details and thus be able to entertain guests, and one of the key points to obtain a good result is to analyze the correct distribution of furniture. 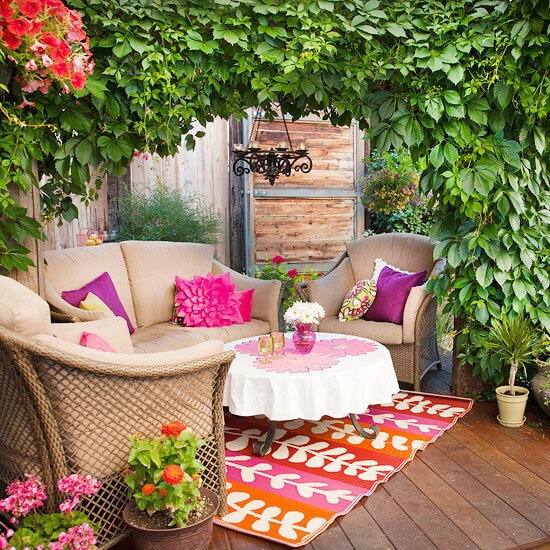 In this case we can see how with two chairs and a sofa placed around a small table invite the guests to sit and enjoy a meeting on the small terrace. A carpet and some cushions were placed in the same tones. A clear example of how to take advantage of and get the most out of a small space, with only minimal investment and great taste. The best way to maximize the space to create spaces for parties is to place the furniture in the way that space can be optimized. In this case it was considered that the guests could have more space if the furniture is placed forming a rectangular space instead of having to move from one place to another putting the table in the middle of the place. By setting a beautiful scene you can create spaces for different parties. It does not matter if the space is large or small. You can even use the free space of a garage to invite your friends to share a good time. In this case paper lanterns, tablecloths and fresh flowers in tones that match perfectly were used. Add cushions or pillows for chairs and furniture that are comfortable to spend long hours of conversation. If you do not have furniture in your patio you should not worry, you can take the dining table, chairs and tableware to spend a nice moment and create spaces for fun and unforgettable parties. Your guests will surely appreciate the extra effort and enjoy the dishes that were chosen for their flavor. It will not be necessary to have a large outdoor table to invite a large number of guests, instead you can place an island designed for any use in the middle of your space and add some stools if any guest wants to sit. This way you can have an area for the preparation of food, and spend a moment of outdoor entertainment. Another good alternative to create spaces for parties is using different small spaces. 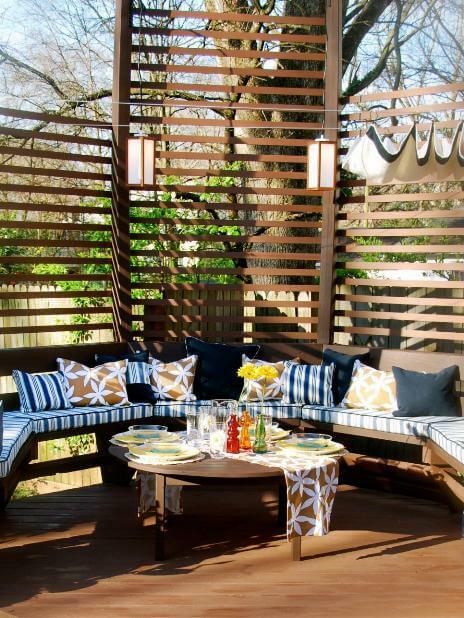 Create different areas designed so that guests can maximize the outdoor entertainment space. You can place a small refreshment table outside a door and serve a more important meal on a patio table. The use of the round tables will allow a greater capacity for more guests, rectangular or square patio tables cause that a distance of space must be taken. Choose a color palette to give a special style to that corner where you will carry out the party. In this case three main colors were chosen and from them a theme was created in the decoration. The details were given by napkins, plates, place cards, paper pom-pons, pennants, balloons. A good measure is to create areas or zones so that the guests can meet. In above picture we can see how wood has become a great ally to create cozy and very beautiful spaces. This environment has a wooden partition with armchairs covered with pillows and cushions of weatherproof fabric. When creating spaces for parties you should think of a space for the placement of a complete buffet in this case the surface of a table, decorated with a striking green tablecloth, to place dishes, crockery and drinks, a place from where people are used guests may serve themselves. If you do not have a table of a reasonable size, you can place some easels spaced and cover them with fabrics of beautiful and striking colors. ← Gardening tips for beginners and amateurs. Do not miss them!